I recently used a giant hourglass as an example of a Twitter feed. Artists get frustrated. "No one follows me. No one sees my work!" is often heard from those just starting out on their Twitter journey. Its can be a difficult and frustrating journey. The game of information on social networks is the key to understanding this often bizarre social universe. So what does this have to do with an hourglass? Well, artists think in pictures. Its hard for us to grasp something unless we can relate it to an image in our mind. So the hourglass is how I imagine Twitter. Every single Tweet you make is equal to the falling of the grains of sand in an hourglass. When you send it out that Tweet, grains of sand falls to the bottom of the hourglass. The more often you tweet the quicker the sand in the hourglass flows. When you stop, the sand slows. If you wait 2 hours between tweets the sand will begin to fall slower and slower. If you take 8 hours off the sand comes to a virtual standstill. Each tweet does not equal one grain of sand. What each tweet represents is the number of viewers who see that tweet. The hourglass is moving constantly when you are an active user. I try to make it a point to send out a Tweet every 15 minutes. I know not everyone can do this, but for those artists attempting to create name recognition for themselves, the more you can Tweet the better for you. Now, here is the mistake most make. They think that just posting and re-posting their work will achieve their goal. IT WILL NOT. In fact it can work exactly the opposite for you. For the hourglass to work, your Twitter feed must have substance. You may get a retweet or two from posting your work, but eventually people will begin ignoring your feed because there is no substance to it. To keep a good flow of sand through the hourglass there must be substance. There must be a reason for people to come back to your feed and want to look at you. The more often you can do this, the more often people will seek your feed out instead of just seeing a post randomly among all the other tweets. 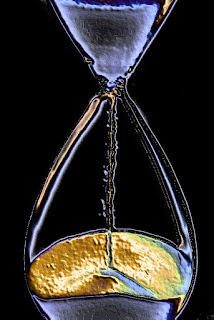 By imagining the hourglass I can envision each tweet shaking the hourglass a bit and making the sand fall faster. I literally wake up in the morning and say to myself, "OK lets get the hourglass moving again. What can I do to shake it up a bit and get that sand flowing. Thus begins a day where I am making art but I am also taking a moment to keep the sand flowing. I may blast out ten tweets to start then I can maintain the flow easily without it disrupting the equally important flow of my art. Anything that takes me more than five minutes to do regarding a tweet is too much. For example, those who follow me, know I often post quote panels regarding art and creativity. These are common sense thoughts and ideas I have on art as the day goes by. At first I would just retype the thought and tweet it. Then I started converting them into a graphic so I could eliminate the typing and just post the graphic with the words on it. These show up randomly on my feed throughout each day. It has substance because (at least I hope) each one has a bit of advice within it. I've eliminated a few precious seconds that I could be using more constructively and still getting the same benefits from the tweet and providing one more tweet with substances back to my followers. Another example is this very article your reading. I try to write at least two or three articles a week. They are more time consuming, but they are a source of substance that followers like. The initial writing of the blog article is time consuming, but once its written it becomes a regular link on my feed. After having written several hundred blog articles, I can now post the link and the title of the article regularly without constantly re-posting the same link to my followers. I pick up a few more readers each time I post and the sand keeps flowing through the hourglass. The thing I think that artists forget on twitter is to use the same creativity that they use in their art to create a flow of information that people want and enjoy. If you can envision that hourglass and couple it with your own creativity, you can and will pick up followers who enjoy your creation. And most important of all you will put your name out there constantly, which ultimately is the goal of any artist in todays art world. NAME NAME NAME.